Why Do The Japanese Love Cherry Blossoms So Much? Finally, A Decent Answer! This is a bit of a teaser post because I’m going to send you over to another blog to find the answer, but I promise you, it’s worth the click. 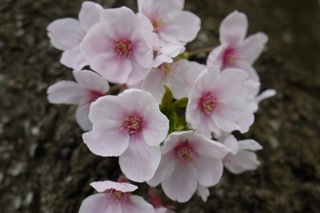 Writer and friend Alice Gordenker has been in Tokyo for quite a long time and has always pondered the question of why the Sakura (cherry blossoms) are such a huge part of Japanese life and lore. Finally she has discovered a wonderful answer and it will surprise and delight you. Be sure to check out this post as well as the rest of Ms. Gordenker’s blog, and look for her column in the Japan Times. 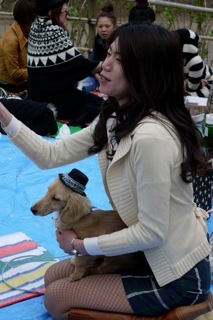 Even dogs dress for the occasion. celebrate – everyone does it. 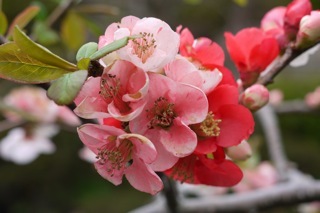 “Where are you doing Hanami this year?” is a popular question. In offices, the boss sends out the most junior associate to stake out the best spot and sit in it until the rest of his colleagues are ready to leave work. Food ranges from onigiri (Japanese rice balls) to sandwiches to elaborate bento specially prepared for the occasion. Wine, Sake and beer are all in large supply for everyone and anyone. Everyone shares. There is all manner of dress – from the formal to the casual. Some of the outfits on the women were unreal in their complexity and attention to detail. As usual, all outfits are not complete until the shoes are considered. The irony is that no one is allowed to put shoes on the blue tarps so you see picnic areas covered with the tarps and the edges of the tarps littered by shoes. 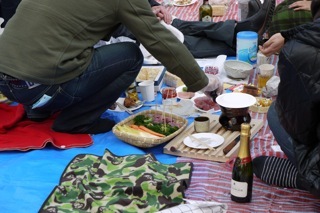 The picnic foods you see in Japan are always entertaining. They go through great lengths to ensure that meals are portable, well balanced and neatly packaged. Obento lunches are common – perfectly boxed little bits of perfection that contain artfully arranged bits of veggies, meat and rice. The Japanese, always environmentally conscious and clean conscious, carry their trash home because there are no litter receptacles in the park. What you bring in, you bring out. It’s a fascinating concept and a wonderful idea. 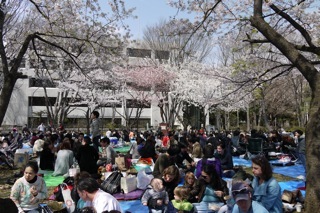 We spent our Hanami Saturday in Arisugawa Park in the Minami Azabu section of Tokyo and it was relaxing to simply while away the hours with friends, drinking and eating and drinking again while the kids all played. There are no expectations or complaints. It was time to just sit and watch the blossoms bloom. In a city of people who spend their time rushing hither and yon, this is a refreshing break from reality. It’s time to work hard at relaxing.